The combined Kitchen/living room has all the amenities you require including a double leather metal action sofa bed and arm chair, a dining table and chairs, a television and DVD player and reading material. The kitchen has all new appliances including a washing machine, hob, (microwave with full oven cooking facilities), small Fridge/Freezer, sink and draining board, a kettle, toaster and all crockery, cutlery and cooking utensils required, an iron & ironing board and a vacuum cleaner. Please Note: All bedding, linen and towels are provided for your stay and Electricity, Gas and Water are included in the price. 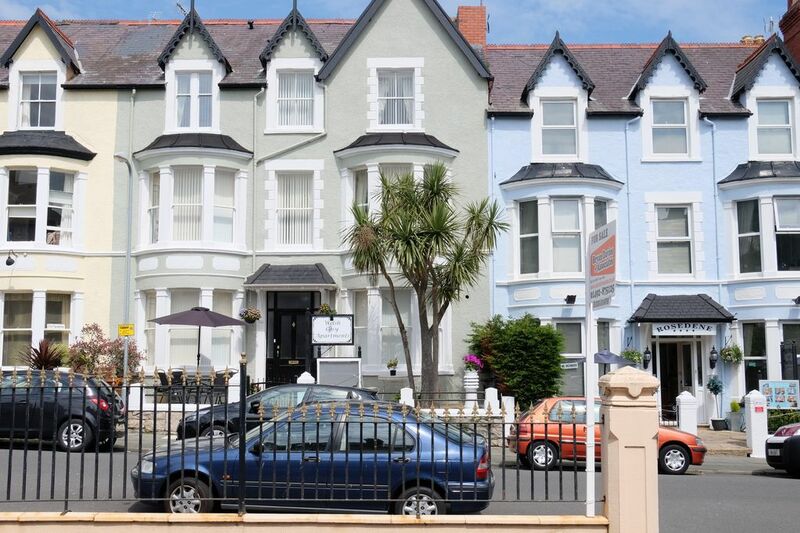 Four holiday apartments available for rent in Llandudno, with close proximity to the beach and shops. The apartments are family run and are furnished and decorated to a very high standard with all home comforts. All have been given a 4 star rating from Visit Wales and are ideally situated for adventurous and fun family holidays, romantic breaks or walking/golfing mid-week getaways. Children are welcome, but sorry, no pets. Our apartments are located in a quiet and pleasant setting within easy walking distance of all the shops and amenities Llandudno has to offer (~3 minutes to the shops and ~5 minute walk to the beach and pier (West Shore). We have a pleasant seating area at the front of the building, so you can sit and enjoy the warmer weather. Llandudno is 3 three miles off the A55, ensuring easy access to Liverpool & Manchester airports, Snowdon, Betws-Y-Coed, Anglesey, Conwy and all the other North Wales attractions. All our apartments are finished to a high standard, and have all been rated 4 Star by Visit Wales. They are fully self-contained and have all the amenities you would expect in your own home, including free Wi-Fi and gas central heating. Bedding, linen, towels, electricity, gas and water costs are included in the price. All of the apartments have fully fitted and equipped kitchens including crockery, cutlery and cooking utensils, washing machines, microwaves, ovens and hobs, fridge/freezers, kettles, toasters, iron & ironing boards, vacuum cleaners. The living areas are comfortable and welcoming and they include new televisions and DVD players. We have a collection of free DVDs for use by our customers. We kindly ask our clients to make a donation in our honesty box. This will be used to replace damaged DVDs and the remainder of the money will be donated to Macmillan Cancer research. All the bathrooms have been rebuilt to a high standard with showers fitted as standard or bath with shower over. Hair dryers are provided. The bedrooms are fully redecorated and comfortable including ample wardrobe space. Cot/mattress and high chair can be supplied if required (bed linen for the cot is not provided). Parking is free in the local area, unfortunately allocated parking for residents is not available, however it’s usually quite easy to find a parking space close by. Further detail for each apartment can be found on the individual unit listings. The apartments are owned by 2 families who share a common a goal, to provide you with high quality, clean and comfortable accommodation, and to help you make the most of your holiday! Apartments 1 and 4 are owned by David and Marthese Johnson, who also live within the property, they are always willing to help you in any way we they can to ensure you have a wonderful & relaxing holiday. They have been running holiday flats and cottages for seven years so understand the needs of our customers. Apartments 3 and 5 are owned by husband and wife, Pierre Frandji and Sharon Longhurst. Although they don’t live in the building they are only a phone call away and will help you in any way they can. You may arrive as strangers, but we hope you will leave as friends. The Welsh Cosy apartments are family run and owned by 2 couples who share a common a goal, to provide you with high quality, clean and comfortable accommodation, and will do all they can to help you make the most of your holiday! The apartments have been completely rebuilt, and incorporate the latest Fire and Smoke detection system with double fire doors and seals on each unit. All the apartments are fully soundproofed and insulated for your comfort and privacy. The combined Kitchen/living room has all the amenities you require including a double leather sofa bed and arm chair, a dining table and chairs, a television and DVD player and reading material. A superb tidy apartment within walking distance of all amenities. We had a really lovely break over the New Year and the hosts were very friendly, it is definitely somewhere we would return to in the future. Absolutely brilliant, highly recommended, will be returning. Thank you. Lovely, clean and comfortable apartment very near to the centre and the sea front. Had a wonderful time with Welsh Cosy apartments as a very convenient base and the owners could not have been more helpful. Thoroughly recommended. Great location. Would stay here again. Always happy to find an accommodation that does not smell like pets. From the moment we arrived it was obvious that this appartment was absolutely perfect, well presented, clean, spick and span and it was a very short walk to the seafront and a few lovely local pubs. Llandudno has two shores, the North shore and promenade is wonderful for the children and has a play area & paddling pool. with Punch & Judy shows and donkey rides on the beach, and you can always get a snack or ice cream. The West shore is a quieter area and has a play area for children and a boating pond, with wonderful views across the estuary towards Conwy. Adults and children alike will enjoy our Alice in Wonderland connection or why not visit our Bodafon working farm and extensive aviary. For our golfing friends, you can use any of our four 18 hole golf courses, suitable for professionals or beginners with optional tuition, and all within 10 minutes of the city centre. When visiting Llandudno please go to the website www.visitLLandudno.org.uk for an up to date guide as to What's On In 2016, or contact or visit our Tourist information Centre (01492) 577577.